Whilst working on a screensaver for a client I came across the problem of multiple monitors. No, not myself as I am too poor to have two monitors on one system. However the client has a PC set up grand enough to make Cape Canaveral quake in its cowboy boots and run like a buffalo. For those of you not aware of the problems of multiple monitors let me explain. Say we take Mr. Monitor here. He uses points to provide a location on his screen. Using an X and a Y co-ordinate like ( 20, 100 ). 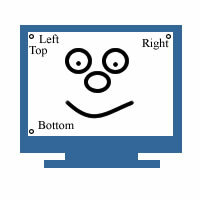 These points are taken relative to (0,0) which is the very top-left hand corner of the screen. If anyone using a multiple monitor system views the app with this code they will only see the screensaver on their primary monitor and will view the desktop on the others. For this we need to include a header file and change a little bit of code. to your Window class source file. That's it! The screensaver will now run over the entire virtual desktop.